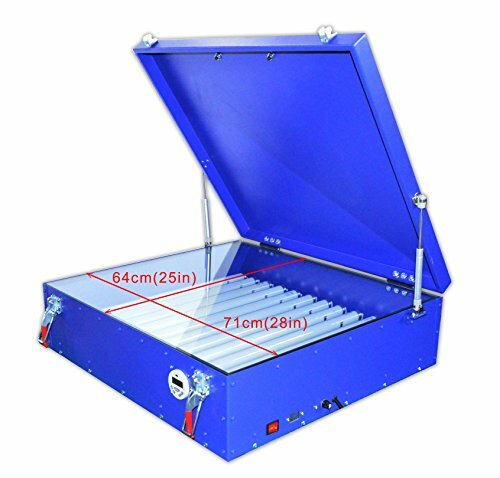 Product Code 006845（110V) Exposure size 28x25 inch Voltage 110v Power 240w Plug American standard Machine using material 3mm steel plate Machine size 31.5x28.3x9.4 inch (80*72*24cm) Net weight 88lb/40kg Gross weight 119lb/54kg Packing size 33x31x12.4 inch ( 85*79*31cm) Packing volume 0.2m³There are twelve 20W UV burning Lamp (total power 240 W). Normally can be used for about 10,000 hours. There are twelve 20W UV burning Lamp (total power 240 W). Normally can be used for about 10,000 hours. The exposing area is 28" x 25 " (71x64 cm), suitable for all kinds of screen frame within this size. With a countdown timer, when the setting time run out, this machine will light off automatically. The timer has a function of automatic memory, once you set done it will keep the same time no matter how many times open and off. This machine attach with 2 pcs foam-rubber cushion. They are used to press the film more closely to the light and improve exposing quantity.